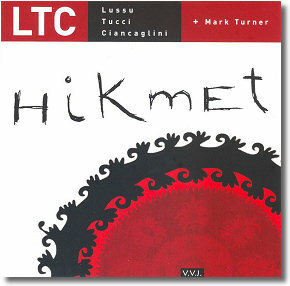 Supporting many of the well established soloists, and providing for the very core of many quartets and quintets renowned in the Italian territory (not last the group with Fabrizio Bosso and Daniele Scannapieco), LTC is the rhythm session that seals this album, Hikmet – named after a famous Turkish poet, writer and memorialist. It consists of three of the more active jazz-players of their generation in the Italian scene: Pietro Lussu on piano, Pietro Ciancaglini on double-bass and Lorenzo Tucci on drums, that, in this occasion, take advantage of the presence of one of the overseas sax-tenor players most appreciated here in Italy, Mark Turner. The opening of the album is entrusted to a very involving medium-rhythm, a compound cadence indeed, Alex Pictures, written by the bassist, that also contains Lussu's smart improvising interpretation. A very evocative Spartacus movie theme, which becomes so winding in Turner's narrative notes as to impregnate itself with the cerebral and dragging musicality that the American saxplayer can create, is preciously escorted by the perfect understanding of the three friends: mostly on the medium range register of Lussu's piano – who could give more indeed –, light but sonorous Tucci's sticks to stress the three movements variously, and the deep double-bass of Ciancaglini that crafts the slow-down closing of the piece. Tucci's sparkling accompaniment in Round Town provides for a brilliant performance, very punctual its rhythm figures, the solo of Lussu is articulated. The delicate composition Pigolio di stelle, by Salvatore Bonafede – Palermo piano player famous for his executive and compositional sensibility –, is translated in act by the persuasive tenor of the American jazzman, who, however, gives his best as the rhythm presses, allowing him to walk along the elegant harmonic webbings of the piece. Lussu's contribution is sober, light and refined as ever. Very vibrative are Tucci's cymbals at the beginning of the tune from which the CD takes its name, favoring Lussu's chords, for an intro that preludes to the melodic intensity of the composition of the pianist himself, and of which the saxophonist renders the thematic discontinuity skillfully, while emphasizing the complex atmosphere of the tonal progressions. There is also space for a composite but not for this reason less infectious Tucci's solo, who is nearly melodic in his use of ride, crash, toms and snare. What in this debut record strikes is the amalgam the trio is founded upon, as it is highlighted in the following two numbers, In dance and Rain Girl – both of them to be listened to for the recitative of the double-bass, with its very round and melodically structured sound –: an interplay being not a surprise at all, with drums and double-bass attached for a long-time acquaintance, a piano that, albeit with no breathtaking solos, is punctual in constructing the rhythm-harmonic lines that act as a substrate for the evolutions of Turner (who is a very special guest, showing he feels right at ease with the company). These "components" all meet in Skylark, a standard, which constitutes the worthy ending of a CD that, without too many shakes indeed, answers well to our expectations of the four experienced protagonists.